Updated Thursday, May 18, 2017, 9:14 p.m. EDT: Three suspects have been taken into custody in the shooting death of 6-year-old Kingston Frazier. They will be charged with capital murder, says Madison County, Miss., District Attorney Michael Guest. Updated Thursday, May 18, 2017, 12:41 p.m. EDT: Dwan Wakefield, a person of interest in the killing of 6-year-old Kingston Frazier, is in the custody of the Madison County Sheriff’s Dept, the Clarion-Ledger reports. DeAllen Washington, another person of interest in the case, is still at large. Updated Thursday, May 18, 2017: Kingston Frazier, 6, was found dead inside the stolen vehicle. He sustained a single gunshot wound. The Clarion-Ledger reports that Kingston was sitting in the back seat of the car when he was shot. Updated Thursday, May 18, 2017: Kingston Frazier has been found inside the stolen vehicle and the Amber Alert has been canceled. According to WLBT, his condition is unknown. The Mississippi Bureau of Investigation has issued an Amber Alert for Kingston Frazier, 6, who was last seen about 1:15 a.m. Thursday when the gray 2000 Toyota Camry (license plate HYX 783) he was in was stolen from a grocery store parking lot. Conflicting reports have Kingston’s age listed as 7 years old. According to the Hinds County Sheriff’s Department, Ebony Archie, Kingston’s mother, left her Camry running with Kingston inside while she briefly went inside the Kroger grocery store located at 4910 I-55 North in Jackson. While Archie was inside, two men in a two-door 2014 Honda Civic Coupe (license plate MDV 361), with a dent on the side, pulled alongside her Camry, and the man in the passenger seat jumped into Archie’s car and drove away with Kingston inside. 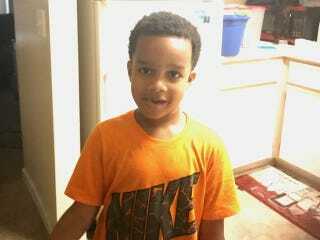 Kingston is described as a black male, 3 feet 9 inches tall, weighing approximately 40 pounds. He has black curly hair and brown eyes. He was last seen wearing a white tank top shirt, khaki pants and black-and-gold Jordans. Hinds County, the Jackson Police Department and the Mississippi Bureau of Investigation are working the case, the Clarion-Ledger reports. Anyone with information regarding Kingston Frazier’s whereabouts, including any information on the cars involved, please call the Mississippi Bureau of Investigation: 855-642-5378. Let’s get this baby home.